The history of Krav Maga (What is Krav Maga?) is closely linked to the lives of its founder Imi Lichtenfeld and the first generation of instructors he trained. The origins of Krav Maga can be traced to pre-World War II Eastern Europe. The system’s creator, Imi Lichtenfeld, was born in 1910 and raised in Bratislava (Slovakia). He was a renowned boxer, wrestlers and gymnast, winning several national and international championships in the late 1920ies. In the mid-1930s, fascist and anti-semitic groups began to harass and assault the Jews of Bratislava. Lichtenfeld organized a group of boxers and wrestlers who took to the streets to defend their community against the growing numbers of nazi thugs. Imi quickly learned, however, that the aggressive and brutal nature of street fighting was quite different from competitive combat sports. It required a different mindset and different techniques. Typically, street assaults were surprise attacks and the outcome would be determined within a few seconds. The looser would get extra kicks to the head and torso causing serious injuries. The re-evaluation of his ideas about violence led him to put more emphasis on quick threat neutralisation. It also led him to develop the skills and techniques that would become the foundations of Krav Maga. Like many Jews fleeing the Nazi persecution across Europe, Lichtenfeld decided to leave in 1940. The ship he boarded was supposed to take him to Palestine which he had visited in 1935, but the derelict vessel sank in the southeastern Aegean Sea. Imi was eventually picked up by a British ship on its way to Egypt where he joined the Czech legion which was under British command. During his time with the British military, he was engaged in operations mainly in Libya. He was also acquainted with the Fairbairn's system of hand-to-hand combat. Without doubt, Fairbairn's approach to fighting ("Gutter Fighting") strongly resonated with Imi. 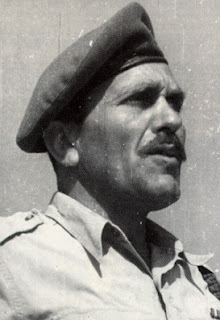 Lichtenfel eventually reached Palestine in 1942 where he was recruited by the head of the Haganah; a paramilitary organization that had been set up to defend the Jewish settlements. This organization later became the core of the Israel Defense Forces (IDF). In 1944, Imi began training Haganah soldiers, including elite units such as Palmach and Palyam, in various fields such as physical fitness, swimming, wrestling and hand-to-hand combat. At the time, this training was called Kapap (an acronym for Krav Panim L’panim "face-to-face combat"). Ultimately, the fighting style would be renamed Krav Maga. Until the 1950ies the terms Kapap and Krav Maga were used interchangeably. Since the 60ies the term Kapap has only been used to describe the training method of the early days or within certain units such as Sayeret Matkal or Yamam, that require more than basic hand-to-hand combat training. Until the late 1990ies, the Kapap combatives system was kept only for the use of Israel's special elite units. Then, Lieutenant Colonel Chaim Pe'er (who trained and graduated in Krav Maga under Imi Lichtenfeld) and Major Avi Nardia founded the International Kapap Federation. Nowadays, Kapap (a.k.a Lotar) and Krav Maga are two different, albeit closely related, fighting systems. Both have their roots in the historical Kapap. Although Krav Maga has become the most well known Israeli martial art, it has never been the only one. When the Israel Defense Forces (IDF) were formed following the creation of the State of Israel in 1948, Imi Lichtenfeld became chief instructor at the IDF School of Combat Fitness. There, for 20 years, he developed and refined his hand-to-hand combat system. To bring each soldier to adequate level of Combat experience in the very little training time allotted, Imi was forced to streamline his teaching and design a system that would be suitable for any male or female soldier. 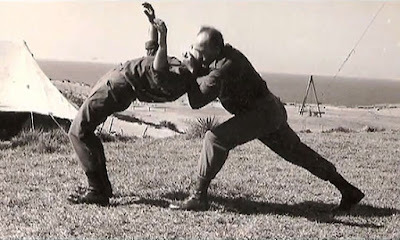 Imi acted as the IDF Krav Maga Chief Instructor from 1948 to 1976. His long time student and first black belt Eli Avikzar succeeded him in this role as Chief Instructor at the Fighting Fitness Academy (which certifies IDF Krav Maga Instructors). Under Eli's guidance, the system became more professional and, proving its efficiency in fighting units, it also became more widely accepted. 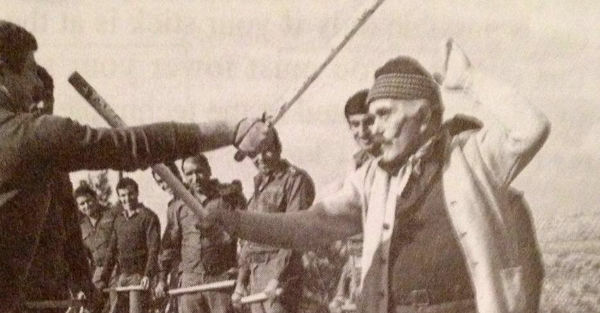 Eli continued to develop Krav Maga within the IDF until his retirement in 1987. In 1980 Boaz Aviram, Eli's assistant, became the third person to hold the position of Krav Maga Chief Instructor at Fighting Fitness Academy. He was the last IDF head instructor to have studied directly under Imi Lichtenfeld. Blaming the civilian schools of Krav Maga for a declined in quality in the system, Aviram who further tested techniques in real situations, later founded Pure Krav Maga. His work, which he systematically documented, is based on a highly structured training method. The focus is on (real life) reaction time and efficient sequential execution. After he finished his active duty, Imi Lichtenfeld began adapting and modifying Krav Maga to police forces and civilian needs. The first Krav Maga course for civilian took place at the Wingate Institute in Netanya, Israel, in 1971, under the direct supervision of Imi. Among some of the first students to receive a black belt in the civilian curriculum were: Haim Gidon, Eli Avikzar, Eyal Yanilov, Richard Douieb (France), Raphy Elgrissy, Haim Zut, Kobi Lichtenstein, Yaron Lichtenstein, Miki Assulin (GB). In 1974 Imi retired from teaching and handed Eli Avikzar the training center in Netanya. In 1978 the "Federation for Krav Maga and Self Defense" was created with the assistance of Imi's top students: Barak Yehoshua (Head of the Professional Committee), Tsvi Morik (Secretary), Haim Zut, Eli Avikzar, Rafi Algrisi, Haim Gidon, and Oskar Klein. Eli Avikzar was elected to the head of rank committee and Colonel David Ben Asher was elected to the Executive Director. The name of the organization was changed to "Israeli Krav Maga Association" (IKMA) in 1980. Under Imi, components from several traditional martial arts were incorporated into Krav Maga training: Judo in 1965, and later in the 1970ies, Aikido under the influence of Eli Avikzar, and more groundwork by Haim Gidon. Imi and his senior instructors worked together to improve the system by incorporating techniques from other martial arts and combat sports, counter-defences and modified weapons defences (particularly knife defence techniques). In the early 80ies, a group of senior instructors traveled to the USA to demonstrate their system. The first Krav Maga training seminar outside Israel was directed by Eyal Yanilov in 1981. With the emergence of the second generation of instructors came internal conflicts over the management of the organization and differences in opinion over the efficacy of techniques. This led to the creation of a number of splinter organizations all claiming to teach the true Krav Maga! In 1994 Haim Gidon was elected as IKMA president. With the development of Krav Maga on the international scene, arose the need for an international organization. In 1995 the International Krav Maga Federation was founded by a number of Imi's students such as Avi Moyal (the actual IKMF chairman), Eyal Yanilov and Gabi Noah. Imi Lichtenfeld died in Netanya, Israel, on January 9, 1998 at the age of 87. Eli Avikzar trained with Imi from 1964 to 1974 and received the first black belt (IKMA) from the founder in 1971. That same year he also received a black belt in Judo and later received his Aikido brown belt in France and a black belt from the European Federation in 1977. He was awarded 8th Dan in Krav Maga by Imi in 1985. As the IKMA head of rank committee and chief instructor, Eli himself awarded black belts to many individuals including Avi Avisadon, Eyal Yanilov, Haim Gidon, and Boaz Aviram. Striving for perfection, Eli Avikzar was able to extract the essence of training techniques and methods from the various Martial Arts he'd learned. Particularly preoccupied with efficiency, Eli used Imi's teaching and principles as stepping stones to further developed and refined Krav Maga. Discord with Imi led Avikzar to resigned from his position at the IKMA. In 1987 he founded the "Krav Magen Israeli”(KAMI) which he directed until his death in 2004. Avi Avisadon, who was Eli's assistant at the Fighting Fitness Academy and then served as the Head of Krav Maga at the Israeli Navy commando, became KAMI's Chief Instructor. Raphy Elgrissy was born in Casablanca (Morocco) where he started boxing at the age of 16. He made a name for himself as a talented and tough fighter. As a young man, he was recruited by the Jewish Agency to help members of the community migrate to Israel. He moved to Israel in 1963 and joined the IDF. While in Netanya, he reconnected with boxing and, in 1964, was introduced to Imi Lichtenfeld who was the Chief instructor of physical fitness and hand-to-hand combat at the Army training facility at the Wingate Institute. The two men got along well and became friends. Imi believed the more exposure you had to a variety of martial arts and combat sports (such as grappling, judo, aikido, etc), the better your Krav Maga would become, so he always encouraged his students to trained in as many styles and techniques as possible. Consequently, Raphy Elgrissy studied various styles, namely Judo and Aikido in which he also earned black belts. Raphy Elgrissy set up his first dojo in Natanya in 1967 and, after Imi passed away, he founded Krav Maga Elgrissy. It was through his connection with an American businessman (Danny Abrahami) that, in 1981, six instructors (Eli Avikazar, Raphy Elgrissy, Reuven Mymon, Eyal Yanilov, Hayim zut, and Imi Lichtenfeld himself) to the US for a demonstration Tour for the Jewish Community Center of America. 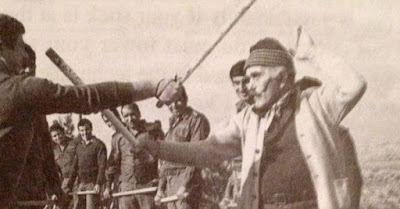 It was during his military service, in 1952, that Haim Zut first met Imi Lichtenfeld who was the Chief Instructor of Krav Maga in the IDF at that time. Haim served in the IDF and trained Krav Maga until the Sinai campaign in 1956. After his release from the military, he settled in Pardes-Hanna where he worked with underprivileged youth. In 1963, he received his license to teach martial arts from the Wingate Institute (Orde Wingate Institute for Physical Education and Sports). His first class was held in Hadera. Then followed, Pardes-Hanna and Gan Shemu'el. That same year, Imi Lichtenfeld was released from his own military duty and started to organise the Krav Maga civilian course. Haim was among the first students to attend the original instructor course in 1971. And, subsequently, became one of Imi's first black belts and top students. As one of Imi’s first instructors, Haim would also become one of the co-founder of both the Federation for Krav Maga and Self-Defense, and the Israeli Krav Maga Association (IKMA). Deeply insterested in martial arts instruction, physical training and physiology, Haim studied at the Wingate Institute and received a number of diplomas and certifications in these fields, making him one of the most knowledgeable Krav Maga instructor. In 1993, he decided to distance himself from the Israeli Krav Maga Association (IKMA) because of the constant infighting and internal politics, and created the Association of Krav Maga International Kapap (a.k.a Haim Zut krav Maga).